Time may heal all wounds, but what about our scars on our skin? Medema Proactive Gel helps to visibly reduce the appearance of the scars left behind with a Triple Restore Action that softens, smoothens and replenishes. 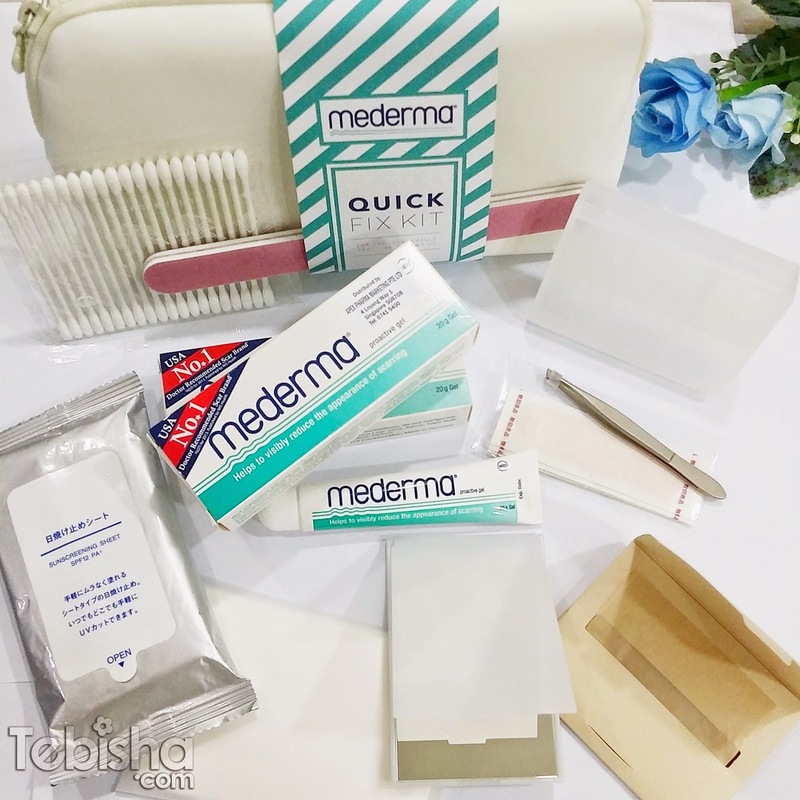 Mederma is a very well-known scar brand in USA, when I googled it, I saw numerous reviews and youtube video by US beauty bloggers, its USA’s No. 1 Doctor recommended scar brand! 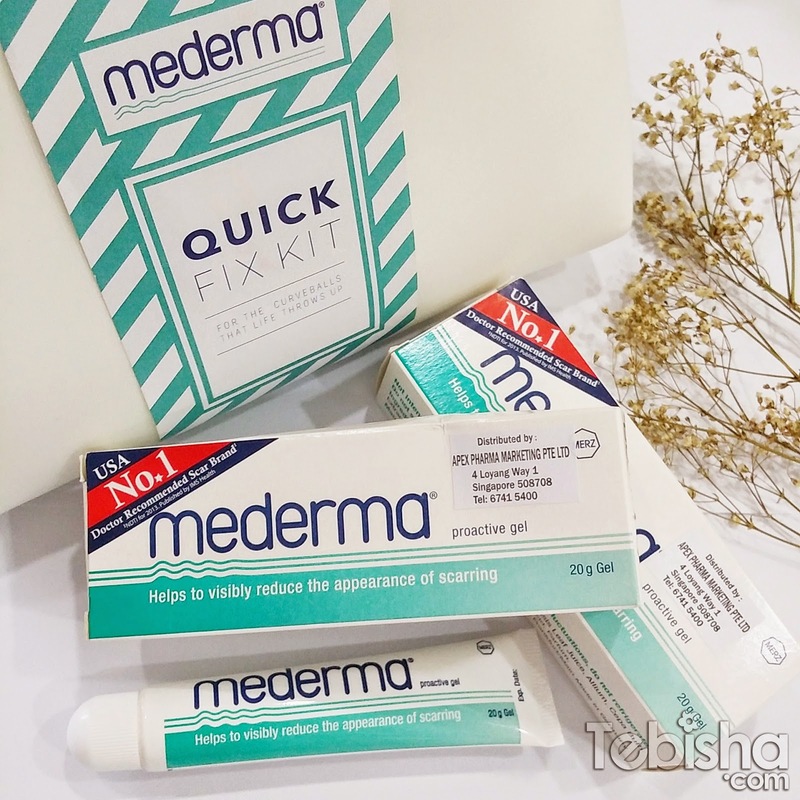 Mederma finally launched in Singapore to save us from scarred for life! Thanks Samantha & Diana for sending me the Quick Fix Kit together with Mederma Proactive Gel. I tried the product for 1 month, it does show tremendous improvement of my scar appearance. I applied my elbow and thigh area with minor scars caused by insect bites. Mederma helps to reduce redness and heal the scar. After 1 week of application, the scar smoothen. You need to continue to apply for 1-3 months in order to reduce the appearance of scar. The after pictures was about 1 month of application, my scars are barely became smaller and barely can be seen. I read up some reviews, some users use Mederma Proactive Gel for operation scar, the results were impressive. Mederma Proactive Gel is lightweight and non-greasy, it gives a fresh scent and cools the skin. Apply generously and gently massaged into the scar at least 2 times a day for 8 weeks on new scars, and at least twice a day for 3-6 months on existing scars. 1. Soften – Cepalin is proven and well-researched anti-inflammatory that helps to soften scar tissue. 2. Smoothen – Allantoin promotes skin healing, reducing itching and smoothening the skin. 3. Replenish – Aloe Vera has a moisturising, smoothing and vitalising effect on skin. 1. It’s the No. 1 doctor-recommended scar management brand in the USA. 2. Its proactive gel formula is clinically proven to be effective against scarring. 3. It helps you feel confident in your skin again. 5 Tips to Lighten Stubborn Scars! Avoid extreme temperatures for six months to a year. Do not go to saunas or stay outside when it is very cold – this may negatively affect the regeneration process of the skin. Make sure you cover your scar well when you go out in cold weather. The combination of Mederma Proactive Gel plus careful massage can help to loosen up the scar tissue and aid the formation of healthy tissue. Apply the gel to the middle of the scar, slowly spread it outwards, and rub it in with small circular motions. In fact, Dr Sunga recommends that you not expose your scar to the sun, as scar tissue does not produce melanin to shield the skin against UV radiation. Always use sun protection when exposing your scar to UV rays. Scars on certain areas such as the elbows and knees may tend to be more scaly or drier. To soften them, add a squirt of Mederma Proactive Gel to lukewarm water and bathe the scar for about 15 minutes. For large scars, the use of a gel dressing is recommended. Soften the scar tissue first using a warm, moist pad. Then apply Mederma Proactive Gel in a moderately thick layer. Gently massage the gel over the scar, cover the area with thin kitchen foil. Put a dressing on top of this. Then simply leave the gel to work overnight. Mederma Proactive Gel is available in 20g ($29.80) and 50g ($59.80) at all Guardian, Unity, and selected Watsons stores. The 50g pack size is only available at Guardian stores.